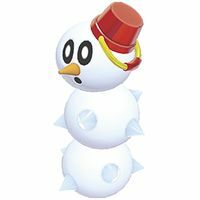 Snow Pokeys are enemies that first appear in Super Mario 3D World. They are white Pokeys that are made of snow. They have spikes on their body, a red pail acting as a hat, and a carrot for a nose. They first appear in Snowball Park, and appear as common enemies in most snow-themed levels after this. Snow Pokeys in Snowball Park. When a Snow Pokey catches sight of the player, it will begin to move towards them. A Snow Pokey can be defeated by hitting its head with a projectile or swiping it with the Tanooki Suit. The segments of the Snow Pokey will turn into snowballs, which can be carried and thrown. If a Snow Pokey is hit with fireballs, snowballs will not appear. Furthermore, a Snow Pokey's segments can be knocked out by tapping them with the Wii U GamePad. If a Snow Pokey's head is tapped when all other segments have been knocked out, it will be defeated. If its head is tapped any time before this, its pail hat will fall off. ↑ Nintendo UK. (December 24, 2015). The Cat Mario Show - Episode 22. Youtube. Retrieved September 23, 2016. ↑ Shogakukan. 2015. Super Mario Bros. Hyakka: Nintendo Kōshiki Guidebook, Super Mario 3D World section, page 226. This page was last edited on December 16, 2018, at 14:12.